In the backyard, the classroom, the community and while participating in sports and other competitive activities, kids are provided with excellent opportunities to learn new skills while having fun. Sports teams teach kids good sportsmanship, self-discipline and how to be a team player. Getting out of the house into the great outdoors allows them to create friendships and stay in shape while getting plenty of fresh air, sunshine and exercise. Team sports also teach kids how to be successful when working together with their peers. Competition is great for kids, but it does have its dark side. Some children become over-competitive and focus only on recognition and winning. When this happens it takes the fun out of the activities they participate in. Kids need to keep a healthy attitude toward competitive activities and as parents it is our responsibility to let them know that it's not all about winning. The importance of participating in competitive activities is to have fun. 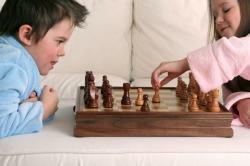 Kids under the age of ten usually lose interest if an activity is too competitive. A good idea for kids in this age group is to allow them to participate in competitive activities but without keeping score. Emphasize that the importance of the activity I to make new friends, have fun and learn about sportsmanship. Encourage young kids to give their best effort and gain self-confidence. When kids enter middle school, competitive activities take on new meaning. Kids like to be recognized for their efforts and winning places them in the spotlight. Winning becomes more appealing. The unfortunate thing is that kids who lose constantly get discouraged and quit participating. They feel they can't accomplish their goals or meet the expectations of teachers and parents. This can lead to low self-esteem and discourage kids from trying their best. It's best to keep them participating in competitive activities even if they only do so in the backyard with a group of their friends. As a parent, never put the emphasis on winning. Rather, encourage kids to always give their best effort. Give kids praise for doing their best whether they win or lose. This sends a positive message about putting forth their best effort. Each child has his own individual personality, which has bearing on how he looks at competitive activities. However, parents, coaches, gym teachers and other adults who instruct him in competitive activities influence his attitude. Kids are affected by the adults around them. If coaches and gym teachers focus only on aggressive behavior during a competition, talk to the league or school administrator. Let him know that you expect the spirit of the team to be more laid back and less focused on winning. If you're not taking seriously and administration doesn't step in, remove your child from that particular activity and place him in one that has a better role model. Getting angry or depressed when he loses. Quitting mid-game when he or his team is losing. Cheating in order to win. Changing the rules to ensure he wins. If this scenario is familiar to you, take a step back. Where is he learning these habits? Many factors outside the home may be promotion his behavior, but it is often picked up from parents. Are you over-competitive? Do you hate to lose? What habits do you have that may promote your child's obsession for winning? Are you sending the wrong message, or could it be your child is misinterpreting you actions? Take your kids to games that involve teams, or watch team sports on TV. Go with them to their school science fair or other competitive activities and be alert for opportunities to discuss proper behavior of the participants. This will allow your child to see both appropriate and inappropriate behavior in those who are competing. Talk to your child when you see inappropriate behavior or bad sportsmanship and ask him to describe how the participant could have reacted more positively. This encourages him to make better choices when he participates in a competition. One of the most important life lessons you can teach your kids is to treat others with courtesy and respect when they are participating in competitive activities. Yes, it's nice to win, but winning isn't everything. The focus should be on giving the best effort at all times and having fun. If they accomplish this, then they are a winner through and through.